SharePoint Form Validation supports a client-side validation for SharePoint list field data. SharePoint Form Validation provides 4 standard validation types for input content check when users create a SharePoint list item in New-Form or edit an item in Edit Form. They are Required Validation, Regular Expression Validation, Compare Validation, and Range Validation.List frequently-used regular expressions in setting pages. ...... Required Field Validator is used for setting whether some column should not be null. Regular Expression Validator is used to check whether inputted content is against a regular expression. Range Validator makes effect when it is required that some value of data should be in a range. Compare Validator plays an important role when data are set to be compared with each other. By default, SharePoint can do some simple validations to SharePoint list field data such as "Required Field" on server side when you submit form. But users often need list field data validations of various kinds on client side. For instance, when submitter creates a task and input data in a SharePoint task list form, administrator may want him to be noticed on the client side if the data of "Start Date" column is later than "End Date" column. 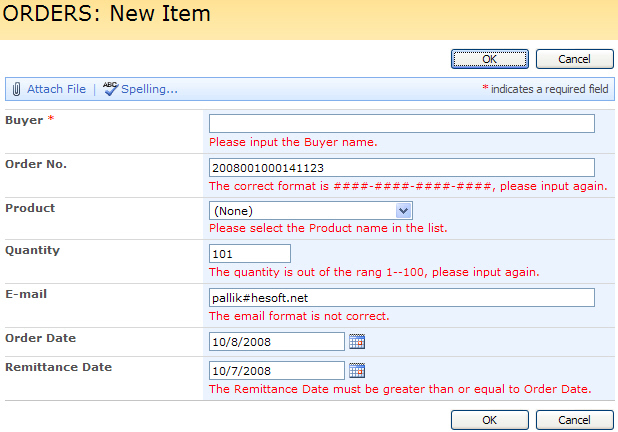 In such a case, SharePoint Form Validation can help administrators achieve it. Easily obtain Address Validation information in an object oriented environment. Liveform 2008 | The Application Engine for SharePoint Technology. Qweas is providing links to SharePoint Form Validation 1.6.813 as a courtesy, and makes no representations regarding SharePoint Form Validation or any other applications or any information related thereto. Any questions, complaints or claims regarding this application SharePoint Form Validation 1.6.813 must be directed to the appropriate software vendor. You may click the publisher link of SharePoint Form Validation on the top of this page to get more details about the vendor.